International criminal law puts the spotlight on the role of specific individuals, and on the domestic legal and administrative mechanisms responsible for international crimes. But it doesn’t operate in isolation; it interacts with domestic and regional bodies of law. Thus, if the ICC is investigating state officials and entities, domestic law in other countries may impact relationships with those under investigation (in some cases even before any prosecutions). Criteria enshrined in international humanitarian and criminal law factor into domestic law-based assessments of inter-state military cooperation, arms trade, and individuals’ (or entities’) ability to travel or manage funds and assets abroad. This means the actions of the International Criminal Court (ICC) could trigger incidental effects far beyond individual criminal prosecutions. Such effects follow from other states’ internal legal obligations to respect international law, and to maintain consistency between their public policy positions and their internal legal order. The ICC examination of the situation in Palestine means third party states and private actors, which have already begun to awaken to the legal risks entailed by their relations with Israel, are likely to become even more acutely aware of these risks Thus, the ICC examination of the situation in Palestine means third party states and private actors, which have begun to awaken to the legal risks entailed by their relations with Israel, are likely to become even more acutely aware of these risks. This arises, in part, due to international criminal law’s “personification effect”: the fact that it pursues and names individuals and private entities involved in criminal conduct. If, for instance, the ICC or other actors raised concerns that Israeli military or political officials, or private entities such as settler land acquisition and management companies, were involved in international crimes, foreign states might find it necessary to restrict their activities, their transfers of funds, and their travel. The European Union (EU) has already enacted similar steps with regards to Russia’s unlawful annexation of Crimea—showing that concerns over international law and legality can have domestic legal effects. For example, an EU Council Decision imposes travel restrictions and asset freezes on 150 people and 37 entities—valid in all EU Member States. The basis for these measures—adopted “in full compliance with the requirements of EU law”, according to the European Council—is the individual responsibility of these persons, including Russian-appointed political and military officials, for furthering and maintaining the illegal annexation and transformation of sovereign Ukrainian territory. Another EU Council Decision directs Member States to respond to Russian actions that are destabilizing Ukraine by imposing a complete arms embargo. The ban, which follows the EU Code of Conduct on Arms Export, is also in line with international standards enshrined in the Arms Trade Treaty. These prohibit arms transfers when there is an “overriding risk” they will be used to “assert by force a territorial claim” or commit grave breaches of the Geneva Conventions. 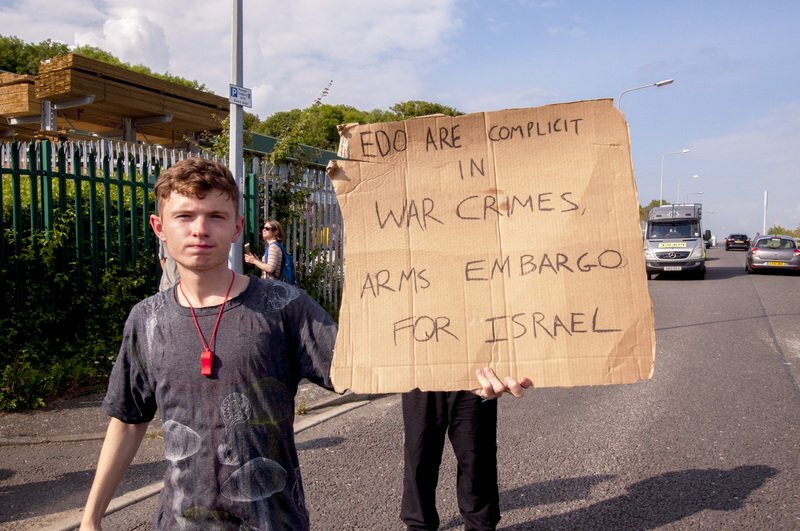 A protest against an Israeli arms supplier in Brighton, UK. In the case of Israel, international investigations and prosecutions of individuals are not, as yet, on the horizon. However, should the ICC take these steps, there could be additional repercussions for Israel’s internationally illegal and allegedly criminal conduct. Such investigations would mean third party states—some which are already considering the effects of Israeli wrongdoing on their domestic legal orders—would have additional scope for adopting restrictive measures to exclude suspect Israeli transnational criminality from their domestic domain. At the institutional level, for instance, some third party states have apparently measured their arms sales and military cooperation with Israel against the risks associated with the Israeli military’s poor record of compliance with international humanitarian and human rights law. Following the summer 2014 hostilities in Gaza, which Israel code-named Operation Protective Edge, Spain banned all arms exports to Israel (it sold €4.9 million of grenade fuses, optical systems, and other arms to Israel in 2013), and the UK initiated a review of its sales of arms and military equipment to Israel (worth £7 billion annually from January to June 2014). In August 2014, the UK Department of Business, Innovation and Skills (BIS) found that there were up to 12 active export licenses for UK arms that may have been used in the Gaza hostilities. It decided to suspend them in the event that hostilities recommence. In October, Israel was apparently excluded from multinational air force drills in Italy. For its part, Israel has launched a series of inquiries into the 2014 hostilities with Gaza, largely aimed at heading off ICC investigations. As part of its attempts to benefit from the privileges of a law-abiding state, it insists that the military’s investigation of its own alleged wrongdoing is in line with international law. The selective enforcement of international law is often criticized. Yet the close ties between international law and the domestic legal order of law-abiding states committed to the project of international law, present opportunities for enforcement. As Jens Ohlin forcefully affirms, “self-interest is the source of obligation in the international system, not its antithesis.” Even short of prosecutions, the normative ripple effects of the ICC’s close examination of Israeli wrongdoing through the lens of ‘international criminality’ are likely to further existing domestic enforcement processes hinged on international legality.